On this page I point out why most of what people think is important in surfactant science is either unimportant or wrong. The rest of this section shows not only what is right, but how useful and useable it is. These pages were written when HLD-NAC was little known and rejected (for illogical reasons) by most of those who had heard of it. Happily those days are past and HLD-NAC is becoming mainstream. 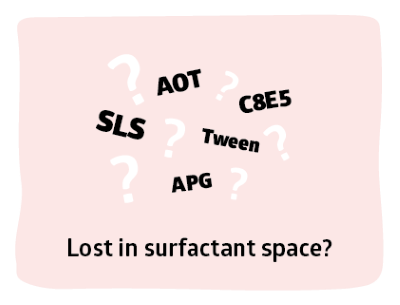 It is very easy to get lost in surfactant space. There are so many (thousands) of surfactants to choose from and so little useful guidance. or Type II (w/o) or Type III/IV (homogeneous) and it doesn't matter if we are talking conventional emulsions (called macroemulsions for convenience, nanoemulsions (nano-sized macroemulsions [yes the terminology is confusing] that are only kinetically stable) or microemulsions (nano-sized drops that are thermodynamically stable). All we want is that our surfactant is mostly at the interface, doing its job of balancing between the oil and the water. Any surfactant sitting around (dissolved or as micelles) in the oil or the water is, for our purposes, completely wasted. Of course people use surfactants to give extra effects such as viscosity via liquid-crystal phases. That is not our main concern here (though we raise the question "why use a high level of surfactant to give viscosity when a low level of a viscosity modifier can usually do a better job") - if you want to use surfactants inefficiently then the surfactant suppliers will be happy to sell it to you. So how do we use surfactant efficiently? 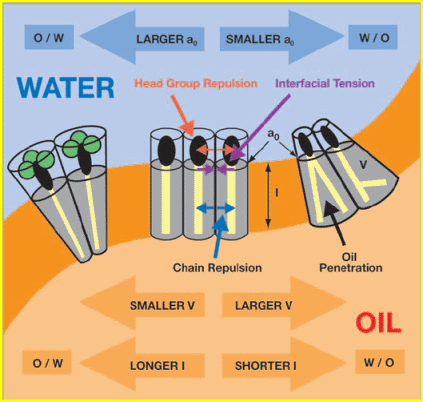 If its head is as happy in the water phase as the tail is happy in the oil phase then there is no reason for it to be anywhere other than at the interface. The problem we face is that surfactant heads and tails are all different, water phases are different (e.g. different levels of salts) and oil phases are different (hexane is very different from isopropyl myristate). To add to the complications, temperature affects the relative "happiness" of the heads. For typical anionics, higher temperature means a greater preference for the water phase, for ethoxylates the water solubility decreases with temperature and for many "sugar" surfactants such as the APGs the temperature has no effect. There's a further complication. 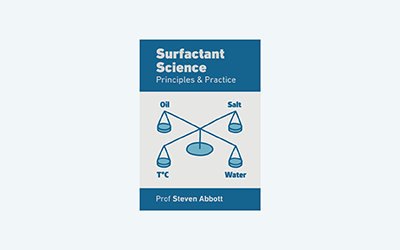 It is highly unlikely that any single surfactant (of course, a single surfactant is itself a mixture of molecules spanning a range around some mean value) will give the right balance. So we have to use mixtures of surfactants. And we seldom deal with a pure oil so we have to be able to cope with mixtures of different oils. 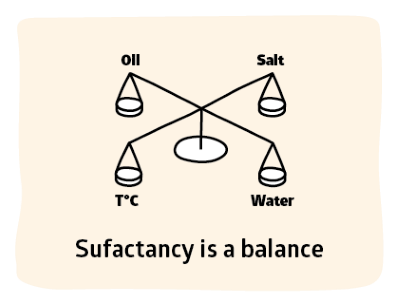 What we need, therefore, is an equation which lets us take into account all these effects and comes up with a number that says how close to "balanced" the system is, and which allows us to see what happens to the system if we change oil blend, surfactant blend, salinity and temperature. 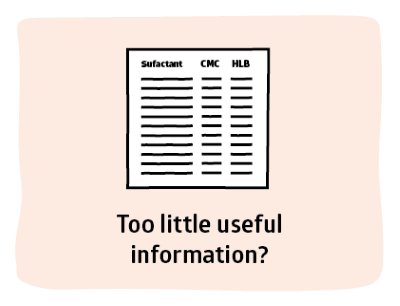 A typical list of surfactants will contain large tables of names, maybe some qualitative statement about what they are or what they are good for and some CMC and HLB numbers that everyone assumes that everyone else finds helpful. They are largely useless. HLB can't do the job because in addition to many other problems, it has a fundamental flaw. HLB is supposed to be about Hydrophilic Lipophilic Balance, yet it is a value given to the surfactant and not to the system - and it is the system which shows a balance, not a surfactant. There is no way round this obvious objection. 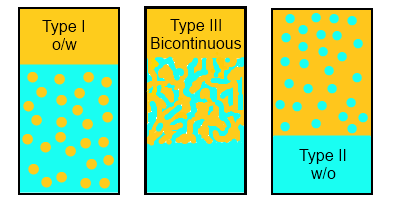 A given surfactant can form just about any type of emulsion depending on the oil, the temperature, the salinity, the water/oil ratio etc. Emulsions are properties of a system and not of a surfactant. So HLB must be wrong. Some attempt (half-heartedly) to provide HLB values for oils, but this is equally wrong - again a given oil can be emulsified in different ways by changing temperature, salinity etc. Add to this critique the obvious lack of an agreed, objective way to measure the HLB of a surfactant and the whole system is clearly deeply flawed. It is infuriating that most formulators today assume that they must use HLB even when it is so obviously wrong. As we will see, HLD is a property of the system which uses Cc and EACN as properties of the surfactant and oil respectively. This is what HLB should have been, but never was. is a neat idea about the way that a surfactant might choose to pack itself: head in or head out. The CPP app shows the basic idea. But it is a fact of life that all surfactants can form o/w or w/o emulsions under the right conditions, so CPP is clearly ruled out as a reliable guide. Indeed, why should a property which is meaningful only in the context of surfactant/water (CPP says nothing about oil associating with the tail) have much to say about anything other than surfactant in water phases for which CPP is not a bad starting point - though the phases adopted by a surfactant also depend strongly on temperature and concentration for reasons that aren't obvious from CPP considerations. But see the Curvature section on Packing Parameter. The Critical Micelle Concentration, CMC,is just about the only other thing many people know about a surfactant. As the CMC app shows there is some interesting stuff to be learned from the experiments that measure CMC, but not a lot of things that are of importance to surfactant formulators are linked strongly to CMC. For many surfactants, CMC is so low that we are using 100x the concentration. And if we have a lot of oil around (as we often do) then there are many issues far more important than the concentration at which the surfactant forms micelles in water. Mentioning oil reminds us that CMC is only about the water/air interface and most of the time we have lots of oil which makes the CMC totally irrelevant. This leaves one approach. HLD (Hydrophilic Lipophilic Difference*) has been around since it was developed in the 1970's by Salager, is of huge importance for the Extended Oil Recovery business (oil companies pay $millions to get results based on HLD theory) and works amazingly well for many other surfactant issues such as cosmetics design or emulsion polymerisation. * The D is sometimes shown as Deviation or Distance. It is a matter of taste - I happen to marginally prefer Difference. A Type III emulsion is in-between with a hard-to-illustrate perfect mix of o/w and w/o, where the phases aren't really "drops" but a fractal mixture. Note that these Types are a continuum of behaviour. HLD allows us to know where we are in the continuum. It is then often explained that those with a large head tend to form o/w emulsions and those with a large tail form w/o emulsions. This is not at all helpful because the Type I to Type II transition is a continuum through Type III and all surfactants can undergo it - so CPP doesn't help you to formulate. It does, however, have interesting things to say about liquid-crystalline phases at high surfactant concentrations, something that is rarely of great interest to the practical formulator.